So you’ve decided to take on a new project and finally mount your TV on the wall. You may be nervous that when you get the TV mount home, that it’s going to be in a bunch of pieces and you won’t know where to start. What a headache! Don’t worry! With a SANUS TV mount, we make it an easy and worry-free task right out of the box. The first thing you see when you open a SANUS TV mount package is the wall plate template. You will actually use this in later steps when you are installing the wall plate as a guide, but it is also a quick start guide to show you the easy 1-2-3 installation that you have with all SANUS products. 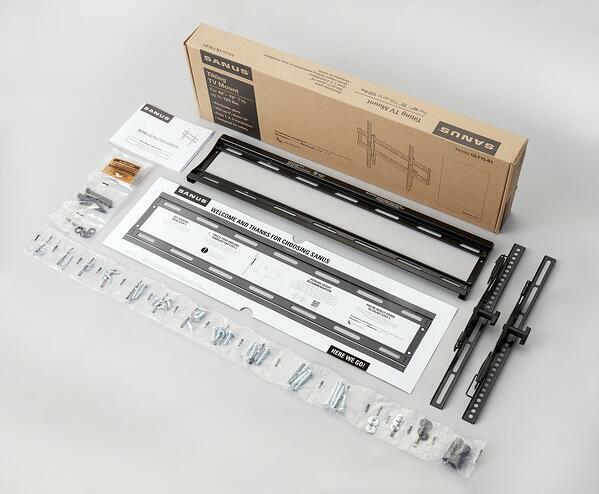 The second item in a SANUS TV mount box is our detailed instruction manual which walks you through a step-by-step process for the install featuring both text and detailed image that correspond with the hardware bag. And then, you get to the pièce de résistance – the TV mount. Every component is layered in just the way you will use it. First things first,the monitor brackets – these attach right on the back of your TV. The next item is the wall plate, you will screw this onto the wall using the aforementioned plate template as a guide to ensure that you are level and drilling in the correct locations. We do this so you don’t end up drilling unnecessary or incorrect holes, our goal is make the process of installing a mount fool-proof! You then attached the TV and monitor brackets right to the wall plate. It really is just 3 easy steps to installing your TV mount. Notice how we supply product in an extremely limited amount of parts, we do this so you don’t have to spend a bunch of time assembling multiple pieces together to get your TV on the wall. Nobody has time for that. The last thing that is awesome about our packaging is our hardware bag. Everything is individually labeled and separated. You don’t have a big bag of screws that you have to dig through for each step. Each description on the hardware bag lines up with the description in the manual, so it’s easy to find. If you do have any questions while mounting your TV, our US-based customer care team can be reached 7 days a week by dialing 1-800-359-5520. That is the SANUS out-of-box experience!